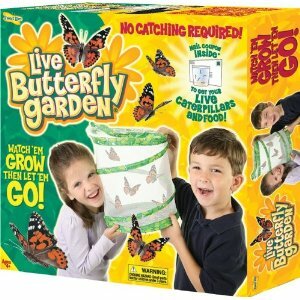 Amazon: Live Butterfly Garden just $11.99 (Reg. $25)! The price is back down again and cheapest that it has been in awhile! Amazon has this Live Butterfly Garden marked down to just $11.99, from $25 today! This kit comes with a observation chamber, supplies for feeding the butterflies, an informative booklet, and a certificate that you send away for caterpillars! https://savvywifehappylife.com/wp-content/uploads/2016/09/SavvyWifeHappyLife-logo-2.png 0 0 Brandi https://savvywifehappylife.com/wp-content/uploads/2016/09/SavvyWifeHappyLife-logo-2.png Brandi2013-07-01 10:10:382013-07-01 10:10:38Amazon: Live Butterfly Garden just $11.99 (Reg. $25)!